This is a sponsored post written by me on behalf of Scott Tube-Free for IZEA. All opinions are 100% mine. I’ll admit it. My family is not always “green”. I’d love to be, but I often don’t have the time or might even simply forget. 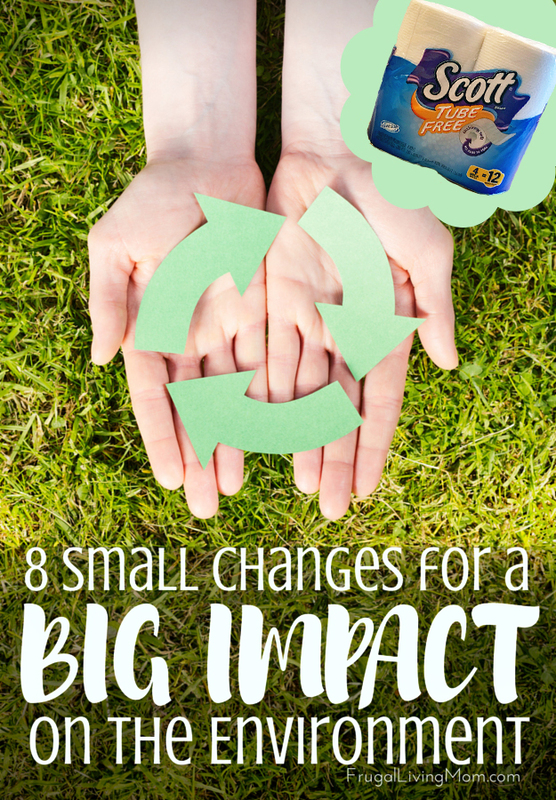 So making sure it’s easy to be green is a priority to me, and I’ve put together 8 Small Changes for a Big Impact on the Environment that has helped out family be more mindful without even having to put in a huge effort. 1. Have a receptacle for recycling in your house. This tip sounds super simple.. but it works. If you have to walk all the way outside to put away your recyclables, you may not do it. Ours is a box that we keep in a cabinet next to the trash can in our kitchen. It’s just as easy to put the recyclables in the box as it is the trash. 2. Use compact fluorescent light bulbs (CFL)– I will fully admit I don’t LOVE the color cast of CFL bulbs. But according to the Environmental Protection Agency CFL bulbs use 75% less energy than incandescent and last as much as ten times longer. So not only is it green… it’s frugal. 3. Use reusable shopping bags. Those plastic bags you get at the grocery store… I swear they breed… lol. You keep stuffing them in a drawer or under the sink and one day your kitchen suddenly looks like a scene from an old Star Trek, but instead of Tribbles you have plastic bags everywhere. Put the reusable bags in your car. I love using them, as they hold much more. 4. 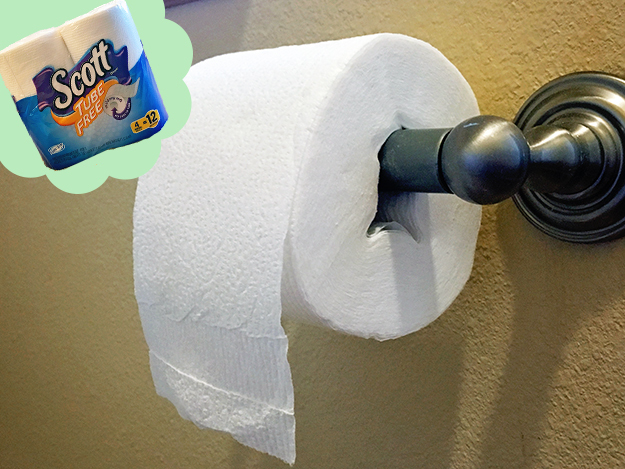 Switch to Scott Tube-Free toilet paper– No tube??? What? What a great idea! Apparently the tube has been used in TP rolls for over 100 years. When you think about it… you don’t even need it. 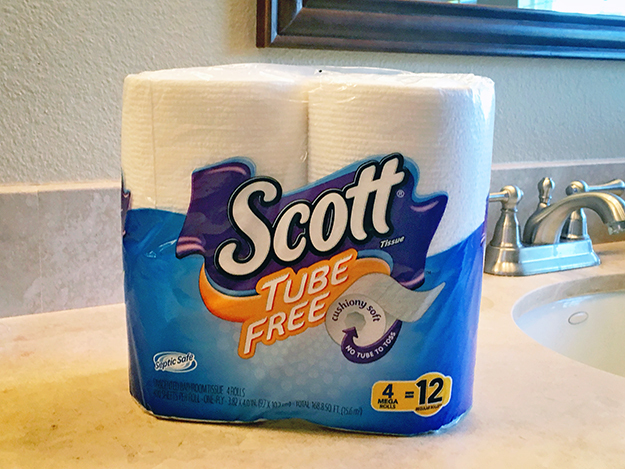 Scott Tube-Free is cushiony soft and unrolls just like any other toilet paper. It’s a SUPER easy way that can have a big impact on the environment. When your family goes “tube free” you will save approximately 150 tubes a year. 5. Forgo the gift wrap. I’m a big fan of recycling gift bags for this. If someone gives me a pretty gift bag, I always save and reuse it. But you can also get creative. Any paper can make an interesting gift-wrap… newspaper.. grocery ads (think for that friend of yours who loves saving money on groceries. The ads might be fun), magazine pages. The possibilities are endless. 6. Stop needlessly rinsing dishes. Sure if you have stuck on food or a bunch of tomato sauce you are going to need to rinse before loading into the dishwater. But be mindful on which dishes are fine to simply go straight in. Most modern dishwashers can handle a few food bits. Score! A time saver AND it’s green. 7. Shop online– My favorite! I love shopping online. It saves so much time, and it seems it can be green, too. According to a study online shopping can have a carbon footprint that is 2x smaller than going to the store yourself. But don’t choose rush shipping (choose ground) and don’t return anything to keep it “green”. 8. Drive the speed limit– Each 10 miles per hour increase in speed represents a 15% reduction in your vehicle’s fuel economy. So not only are you spending too much on gas… you are risking getting a ticket. What are some other ways you have made being green easy? I’d love to hear about them. And make sure to check out this fun video where Scott Tube-Free teamed up with a YouTube prankster using 66,000 tubes (did you know that is the amount of tubes Americans go through in just over two minutes? ), to demonstrate how the toilet paper tubes we use have a big impact on our world. You can buy Scott Tube-Free at select retailers nationwide and online. To find out where you can grab a Visit scottbrand.com/where-to-buy/tube-free-tissue to find a store near you. For fun head over and see how many tubes your household uses in a lifetime and get a Scott Tube-Free coupon at TossTheTube.com. A great way to save the environment is to cut out all meat, dairy, and eggs. Animal agriculture is actually the #1 cause of pollution, not gas-powered vehicles as most people think. If anyone wants to learn more, the documentary Cowspiracy is amazing.